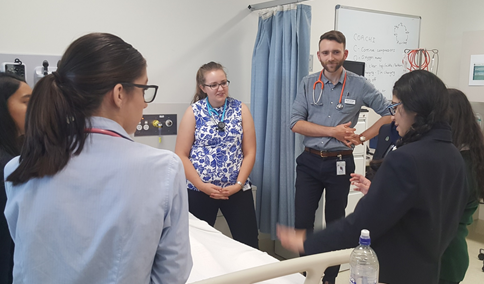 On Tuesday 23rd May, Northern Clinical School and follow NCHER students played host to 65 high school students as part of the LEAP into Health program. LEAP aims to demystify the links between school, higher education and professional careers, helping students to understand the possibilities and value of Higher Education in realising career goals. Northern Clinical School medical students were joined by their fellow Northern podiatry, nursing, occupational therapy, dietetic and physiotherapy students that volunteered their time to talk to the students about how and why they had chosen their current educational paths and taught the high school students how to take vital signs. During the afternoon sessions, our Northern students lead activities that included Basic Life Support, physio exercises, hand hygiene techniques and education regarding the amount of sugar found in popular drinks. The day was yet again a success and enjoyed by both the Northern students and high school students alike. Feedback from school students was very positive. “I learnt how important each type of health professional is and how they affect people’s lives”’. The feedback from teachers was incredibly positive too, with many thanking the many student volunteers, all of whom provided invaluable information to the high school students. The Northern Clinical School looks forward to the opportunity of offering this experience to more local students in the future. A big thank you needs to go to all our volunteers on the day and those behind the scenes who organised and assisted in making this event successful.